Developing friendships and delighting in others is an important aspect of early childhood. Children’s friendships in early childhood are so much more than having someone to play with. 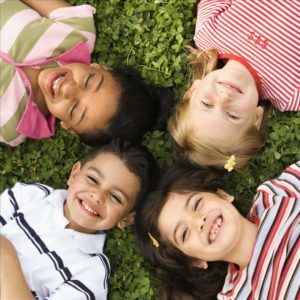 Friendships provide a platform for children to practice their developing social interaction skills with the familiar responses of their friends. Through friendships, children can learn to negotiate, empathise, stand up for themselves, stand up for others, listen, ask questions and genuinely have an interest in people outside their immediate family. Establishing friendships and growing social interactions is also a means for children’s wellbeing to develop. Building conflict resolution skills and developing sympathy and empathy towards others are nurtured through social interactions. Developing respect through acknowledgment of differences and learning to co-operatively play alongside others. (Outcome 3: Wellbeing EYLF). From birth, babies spend almost every waking minute developing their first relationships with parents and caregivers. Imagine a 4 month old baby who is cooing and babbling away looking at the caregiver with an inviting look on their face. The caregivers response is warm and loving ‘’oh what an interesting story you are telling me!” and a big bright smile spreads across both the baby’s and adults face. These interactions are so special and form the foundations of relationships. From this, babies learn that they can trust others to care for them, have their needs met and enjoy life with others. As they grow, children begin to form a wider network of relationships including friendships with peers. As a toddler, learning from one another and forming friendships occurs through imitation and parallel play. Picture a group of children sitting on the car mat with lots of different cars and building blocks. ‘’Brrrrrrrrrrrrrmmmm” hums one of the children as they drive their car around the mat. They look to their right and notice another child has built a bridge with the blocks to drive their car under. They watch intently as the child carefully pushes their car under the bridge and continues on. Instantly the child decides to build their own bridge with blocks and copy this action, by driving their car underneath. ‘’Brrrrrrrrrrmmmmmmmm” he continues. Now both children are driving their cars around the mat and under the bridges, completely animated and engrossed in their imaginations. Not yet a reciprocal interaction, yet a positive experience for both children. Moving into preschool and we really begin to notice friendships developing amongst children. Children will start to connect with others who have similar interests to them. Playing dress-ups together and pretending to go on adventures to the doctors, the zoo, and the childcare centre! Playing in the mud kitchen outside making cakes or searching for bugs and creepy crawlies in the gardens, they love to explore with their friends. Often children will begin exclaiming proudly ‘’Max is my friend’’ when you arrive to childcare, and will wonder ‘’Will Max be here today?” as you are driving to the Centre. Imagine the pleasure on their face as they run over in excitement to greet their friend who is already there drawing at the craft table. As early childhood professionals we value the importance of establishing strong, secure and reciprocal relationships with every child. ‘’When children feel safe, secure and supported they grow in confidence to explore and learn’’ (Early Years Learning Framework, p.20). Children learn from their peers, try new things, take risks and learn to accept challenge. Social play teaches children to share, to be assertive and develops their cognitive skills through collaborative play. It teaches them to discover how things work and make meaning through exploration. (Outcome 4: Learning EYLF). Sandcasltes Childcare offers quality childcare and early education services in the Brookvale, Chatswood, Chatswood 2, Elanora Heights, Harbord, Elanora Heights - Kalang Road, and Mona Vale areas in NSW.